Linklaters LLP (13 rue Brederode, 1000 Brussels – near Porte de Namur). We look forward to welcoming all members to our AGM 2019. It is usually dynamic and quite some fun. Your interactive participation is encouraged. 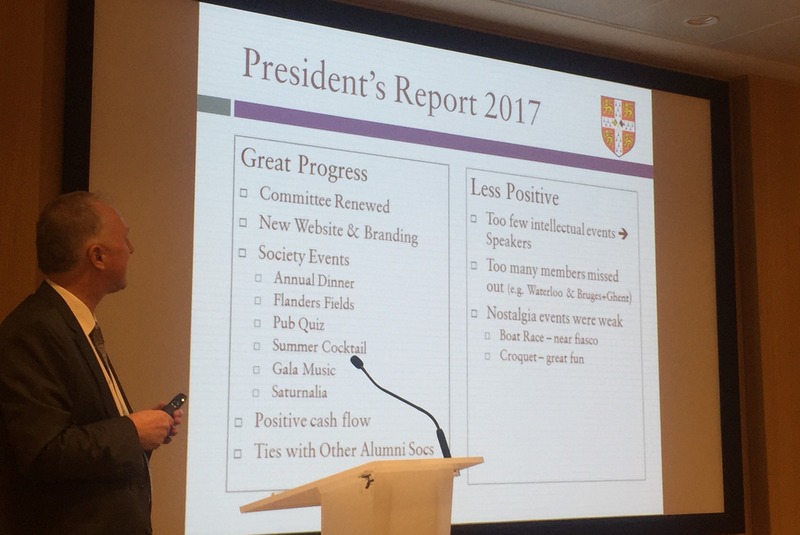 For those of you who might not know, the Cambridge Society of Belgium is an informal group of friends who are Cantab Alumni. Although having many of the attributes of a more formal organisation, we have no written constitution nor an obligation to hold an AGM. However, we believe holding an AGM lets us go through many of the useful formalities and that the Committee & ideas to be periodically refreshed. The AGM is one of the more important events in our calendar. The purpose of this meeting is: To undertake the formalities necessary for a well organised society. Such as the review of the accounts, elections of officials etc. Also it is an opportunity for the Committee to present the work done in the previous year, and an opportunity to express your ideas and opinions about the Society, such as events that you would like to see organised, or any other aspect of the Society which you would like to discuss. Drinks and snacks will be provided. We refer you to the agenda below. Two members have stepped forward as Committee candidates to be elected (two year terms) and three members of the Committee are up for renewal – President, Secretary and Treasurer. We would like to encourage all of you to run for a position on our Society’s committee. No experience is required at all, so please don’t hesitate! We would also like to encourage you to consider contributing to the work of the Committee, either in a specific role or as part of a core group of “auxiliary committee members” who would be willing to give a hand on an ad-hoc basis. We strongly solicit ideas for new activities and feedback on past events. Please notify us of your attendance either by clicking here for the doodle or by sending an email to secretary@camsoc.be. If you are unable to attend but have ideas you would like to share, please don’t hesitate to get in touch with us via email (or you are also more than welcome to send a member to the meeting on your behalf with a written proxy to vote). We really hope to welcome you , and look forward to hearing from you.